Wow! So purty….gonna have to try this! wow that’s gorgeous!!!!! it was super easy to follow and really fun! its the prettiest bracelet yet! OK, I have been totally into this! I have made tons of these, and like mixing and matching buttons and colors. But, seriously, THE HAWKS ARE GONNA DOMINATE!!!!!!!!!!!!!!!!!!!!!!!!!!!!!! what kind of loom do you have?? 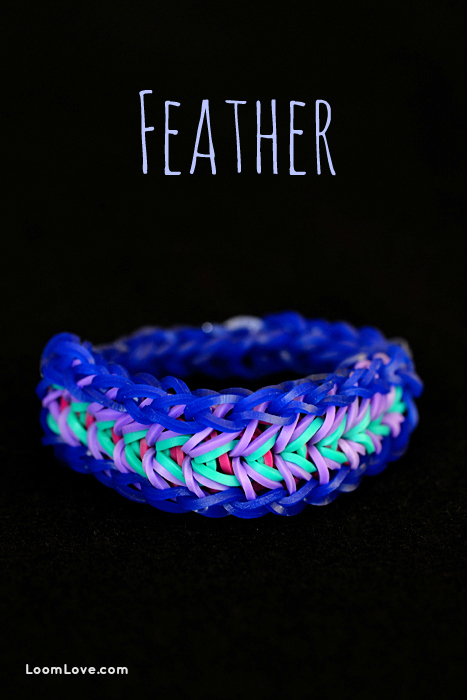 *sigh* Why do people think they need a rainbow loom to do things like this? Seriously? I have a cra-z-loom and if I sit down and think hard enough about what they’re actually doing I can do it. Think I may as well break down and start making tutorials on how to do things with my cra-z-loom so other people will start figuring out that “Yes, you CAN!” You CAN do this. You just need PATIENCE and a little bit of CREATIVITY. Plus a few teaspoons of improvising. Next thing you know, you’ve got the same thing. 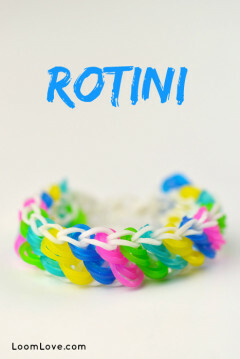 This is so easy to make and it loooks awesome when you are wearing it! This is so cool! I am going to try this soon. This is so cool! I’ve been at your website,Susan! Oh, and I love your book! It really helps,it does. Can you try to make it in the staggered? 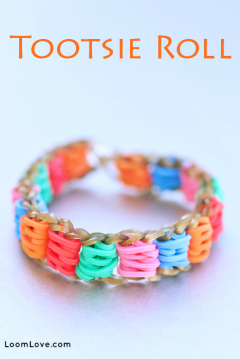 I had to make a home made loom to make this bracelet. This is my favorite braclet yet!!! Once u know how to make it, it’s really easy!!!!!!! !thanks for everything loom love!!!!!!!!!!!!!!!!!!!!!!!!!!!!!!! Hello. This was really hard to take off. Though the tutorial was really good! Wow loom love. Your tutorials are the best. This is an awesome bracelet!!!!! It is very hard and I do not have the right loom ???????? Tried this about an hour ago! Complicated at first but then you get into a system 🙂 looks awesome! And I totally reccomend it!! Got my loom a month ago made about 200 it’s gone mad at school everyone selling TH and wearing them everyone has a loom bringing them in to make at break! It’s okay but I think you should make it less complicated ! ???????? Cooooooooooool this is my fav bracelet ever!!! Really easy to follow but one of my bands broke while I was looming so it almost was a super FAIL! Thanx loom love-the best loom site ever! 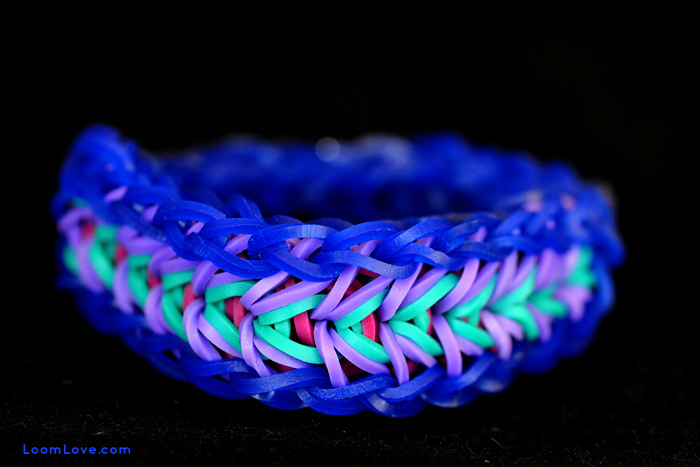 Sat at my computer and made this with my Cra-Z-Loom. I was cringing the whole time because of the tension, but I did it. All ya really gotta have to do this stuff is patience and the will to be popped a few times if necessary. In the end, though, you end up with the same product. GREAT tutorial. May I ask permission to make a version of this for the cra-z-loomers out there? When I get to the end and take it off it starts to unravel. How many times does it take to do it? I already did it 12times!!!!!! I NEED HELP!!!!!!!!!!! I looooooooooooove this bracelet!!!!! !It’s ssssssssssooooooooooooooo pretty!!!!!! So easy to make and it looks gorgeous!!!! WOW! I love this design and website! This looks alot like the arrow stitch bracelet.